Another great easy recipe from the Tigelaar household! This dish is great if you are feeding a crowd but easy enough to make for just a few people. You can make it the night before and let it sit in the fridge but it really takes no time at all to prepare. I often just take 5 minutes and throw it together in the morning! Melt 1/2 T butter per egg in a baking dish. Put 2 eggs per person on top of the melted butter. Sprinkle chopped green onions on top of the eggs (about 1/2 T per egg). 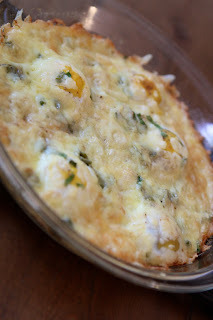 Copyright © PrepAhead and Dine In: mary's baked eggs. All Rights Reserved.